“My baby’s tummy is filled with so much infected fluid that it looks like it can burst any time. It is putting so much pressure on his small lungs that he finds it difficult to breathe properly now. Even drinking a mouthful of milk has become impossible for my poor baby. He cannot go on starving and breathing poorly like this for long. His liver is fully damaged and only a transplant can save him from death. 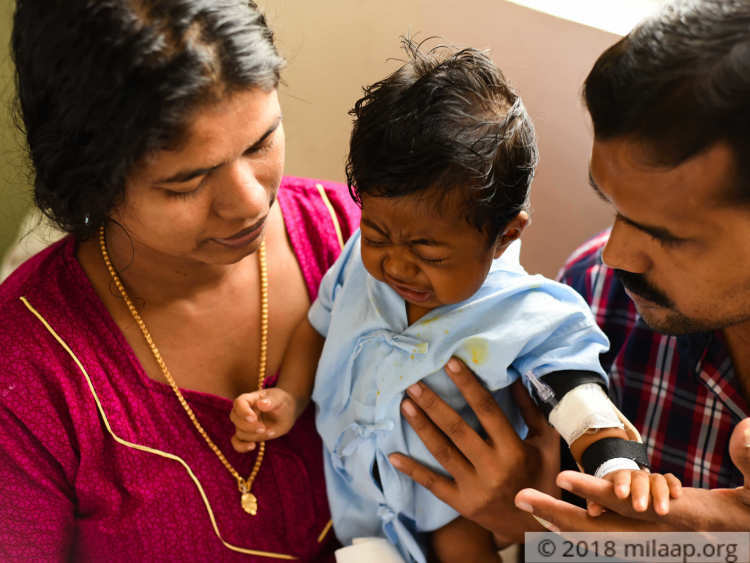 Being a poor driver who has been jobless for months now, I cannot afford to save my innocent child who is suffering every minute,”-Santhosh, father of 5-month-old Abhinand. Abhinand is the second child of Santhosh and Jayashree, belonging to a lower-middle - class family in Kerala’s Palakkad district. Santhosh, a driver with no regular income, always managed to make sure that his family had food on the table and a roof over their heads. 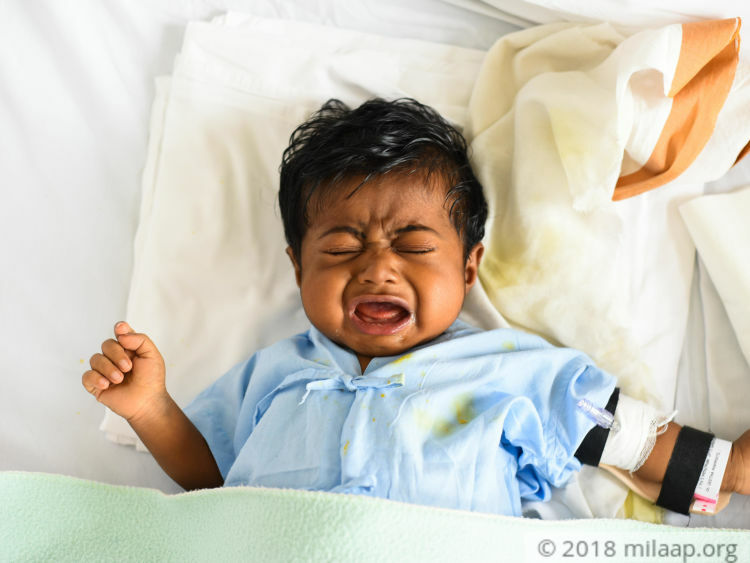 Abhinand’s health was no concern for these parents until on the 40th day after his birth, they noticed that his urine looked unusually yellow. “We took him to a local clinic in our hometown, and were relieved when the doctor said that we just had to keep him under the sunlight for a couple of days. We have heard of some babies having this issue so dismissed it as a small thing. Little did we know that it was just the beginning of worse things to come.”-Jayashree, mother. Santhosh and Jayashree grew increasingly anxious when Abhinand’s eyes and skin became yellow as well. To add to their worries, he started becoming increasingly irritable – like he was in some kind of distress at all times. This time, they decided to take their boy to a government hospital in town, believing that they would get some answers. But looking at Abhinand, the doctors there recommended taking him to a better private hospital in the neighboring district. where Abhinand was admitted for almost a week. “Something in my heart told me that what we had thought to be simple jaundice was definitely something more dangerous, but doctors couldn’t understand what it was. We were growing more tensed and impatient with each passing day – we just wanted God to make the yellowness go away at once."-Jayashree. 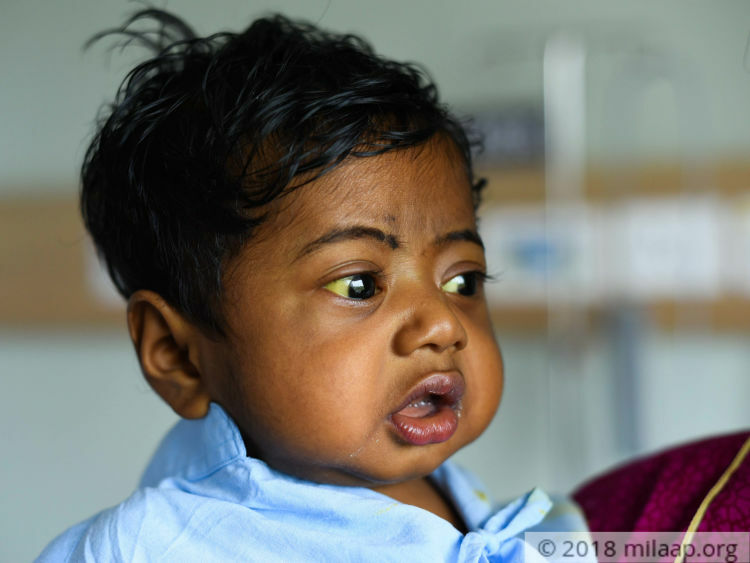 After many rounds of tests, it was in a hospital in Ernakulam that this baby boy was found to have biliary atresia, a disease where tubes that allow the drainage of bile into the body are blocked or absent entirely. This causes bile to become trapped and accumulated, causing irreversible damage to the liver. The doctors suggested that Abhinand undergo a surgery (Kasai procedure) to lessen the obstruction of bile ducts soon. “We were shocked to learn that our baby had a liver problem. But when the doctor said that it could be corrected by a surgery, we saw light in the darkness. We were hoping that he would be healthy in no time after the surgery, but sadly it did not happen.”-Santhosh, with tears in his eyes. The surgery was not successful. 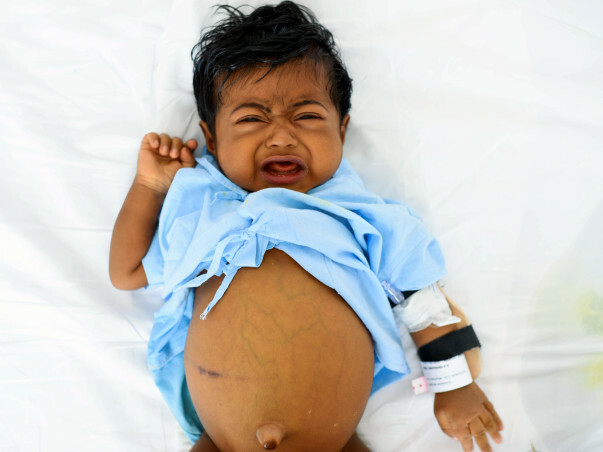 Baby Abhinand’s yellowness became even more defined, and his tummy also started bloating. The parents were horrified when he began passing white, pasty stools. Another trip to the hospital gave them the shocking news: Abhinand’s liver had completely failed and now his only curative option was a liver transplant. Without it, he would not survive beyond a few days. “Our baby’s life is in danger at this point. His liver has lost its function completely and the doctors have clearly told us that he will not live without a new liver. Till now, I have spent around 3 lakhs for his treatment by selling my wife’s jewellery – the only precious thing we owned – and am left with nothing. 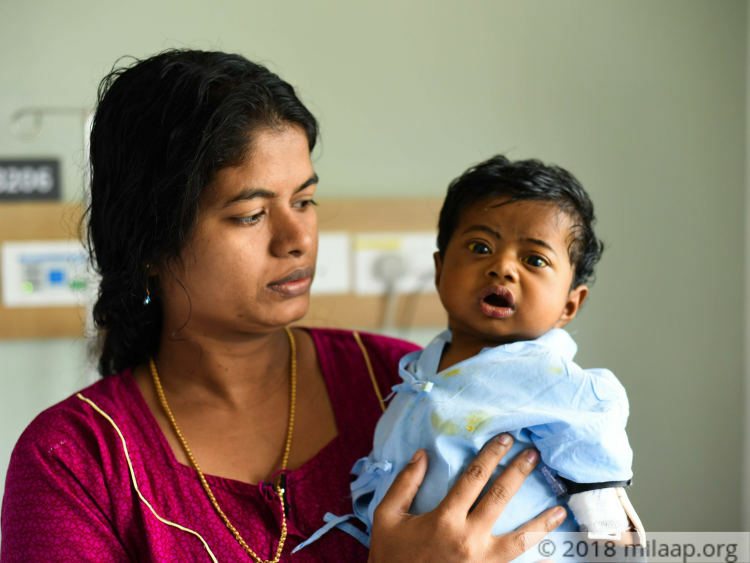 I will lose my son without help.”-Santhosh. 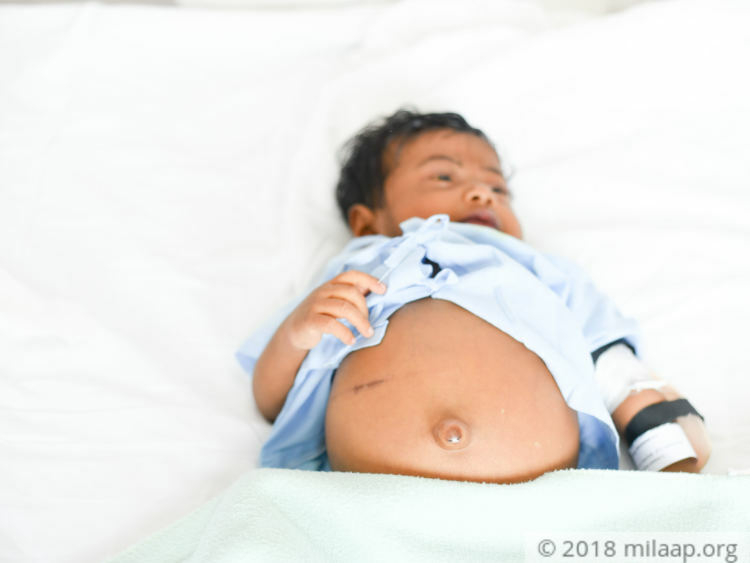 When baby Abhinand is not crying his lungs out, he whimpers softly – however he expresses it, he is always in pain from his abnormally swollen tummy. 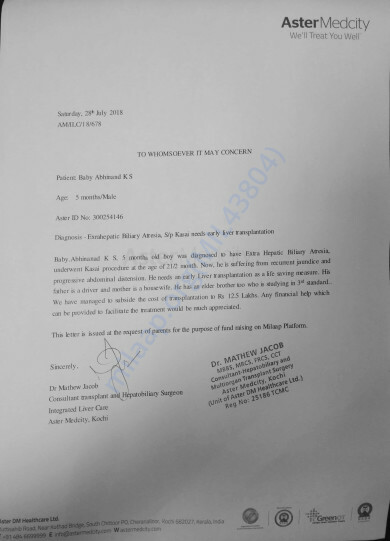 Doctors have warned the family that the fluid inside it is already very infected and the infection stands the risk of spreading to other organs like kidneys. Without an immediate liver transplant, death will come for this poor baby boy whose driver father has run out of all financial options to save him. His mother is ready to give a part of her liver for it, but money is a big problem for this poor family. With a heavy heart, I regret to inform you that Abhinand is no more amongst us. He was on the ventilator for a long time after which the antibiotics reacted with the child's heart and he couldn't survive the same. Please pray for his soul to rest in peace. The funds will be utilized to clear his medical bills. A big thank you to all of you for the constant support. Thank you for the love and support. 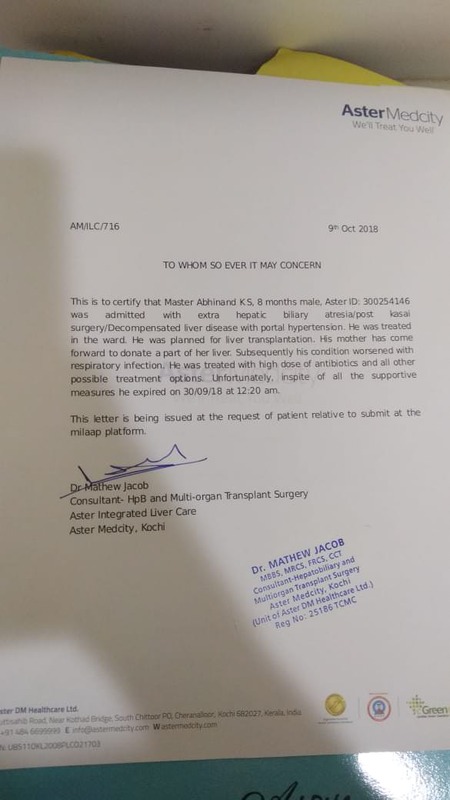 Here is a quick update on Abhinand's health. Currently, he is not doing well as he had been facing respiratory problems from past two weeks. He has also got some infection due to which the transplant is postponed. Hopefully, he can undergo the transplant within next two weeks if he recovers from the infection. Thank you so much for the wonderful support you have shown towards Abhinand. Currently, he is in the NICU and undergoing the treatment. His health condition is stable and he is responding well to the treatment. The blood count is a little low, however doctors are monitoring him closely and taking the requisite tests. Doctors are of the opinion that he can undergo the transplant by next week if everything goes well, his mother is planned to be the donor for the same. Thank you once again. Please pray for his health and speedy recovery.